Ellen of Family Around the Table and Christie of A Kitchen Hoors Adventures invite us each Sunday to join them as we celebrate Family Dinners. Each week we are given a different theme to help us plan and share time with our family around the dinner table. This week they asked us to make and share recipes featuring potatoes as February is National Potato Month. I halved the recipe and still had more than double what I needed for 4 entree servings. This dish is very rich. The browned butter sage sauce is decadent. I think that this would be better suited as a pasta course or first course at a dinner party. It is delicious but a little went a long way. The nice thing about this recipe is that it freezes very well. 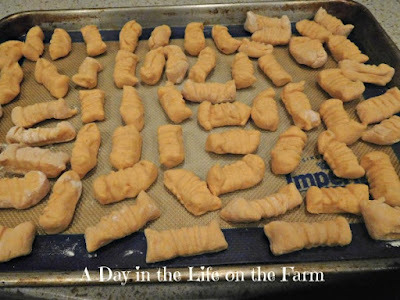 After the gnocchi are formed place them onto a baking pan and put them in the freezer. Once frozen, transfer them to freezer bags in the amount that best suits your needs. They can then be finished by placing the frozen gnocchi directly into boiling water until they float to the surface. Top them with the browned butter sage sauce or use a different sauce for each batch for variety. Combine the sweet potatoes, ricotta, parmesan, brown sugar, salt and nutmeg in a large bowl. Stir in the flour, a third cup at a time , until a soft dough is formed. Turn onto a floured surface and divide the dough into thirds. Roll each third into a rope approximately 1" thick and cut each rope into 20 pieces. Roll each piece over the back of the tines of a fork that has been dipped in flour. Place onto a baking sheet that has been lined with parchment paper or a silicone mat. The gnocchi can be kept at room temperature for up to 4 hrs. or you can place the baking sheet into the freezer until individually frozen at which time they can be separated into bags for cooking later. When ready to cook the gnocchi. Bring a large pot of generously salted water to a boil. Add the gnocchi to the water and cook until they float to the surface, about 5 minutes per batch. While gnocchi is cooking, melt the butter in a cast iron skillet over med high heat. Cook, swirling the pan, until the butter solids start to brown and smell nutty. Remove from heat and stir in the sage. Place the gnocchi into the browned butter as they finish cooking and toss to coat. I have not made gnocchi before, but it seems like something I could do! This looks delicious Wendy! I love, love, love gnocchi! I need to try a sweet potato version. Thanks for the recipe! Never thought about making gnocchi from sweet potatoes before. Great idea! They look so good and I love that you can make extra and freeze them. Yes, they are good Lisa. 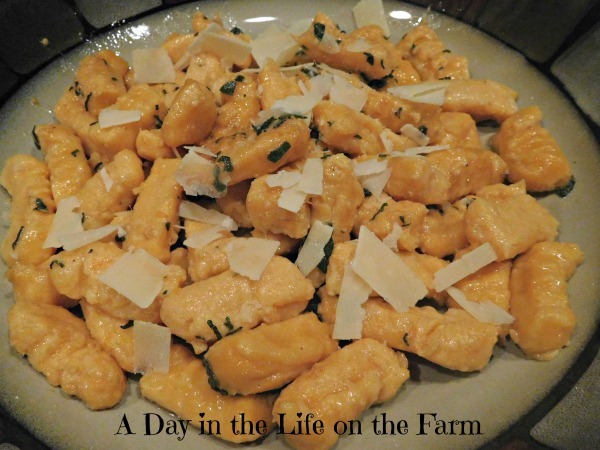 I have never made gnocchi! It's been on my list for a very long time too. These sound delicious and I love that you can make a bunch and freeze them for later. It's not difficult at all Karen. We make gnocchi all the time! I can't believe I've never made them with sweet potato. I'll have to fix that soon. Thanks for the nudge, Wendy. Let me know how you like them Cam. 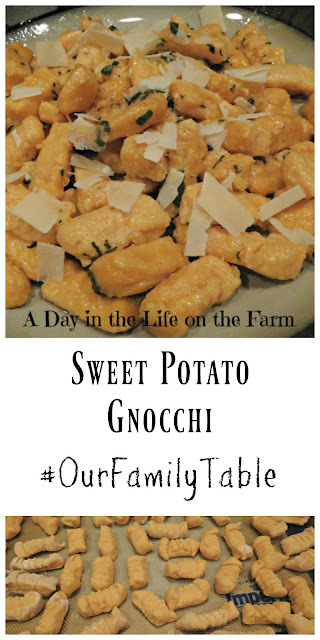 I love that you made sweet potato gnocchi! Such a great idea and then pairing with a brown butter, delish!